Everything You Need To Know About Winning With Yard Signs. 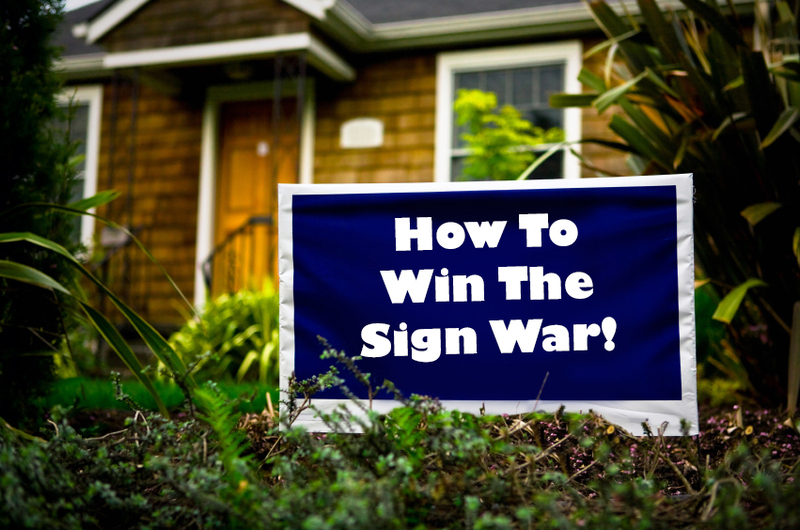 Victory Enterprises > Blog > Everything You Need To Know About Winning With Yard Signs. 4 Mistakes Political Candidates Should Avoid When Door Knocking. It’s Time For Political Candidates To Break Out Of the DC “Box”! An effective yard sign strategy can propel a campaign to victory. We have printed more than 12 million yard signs since we began helping candidates. I founded the company after defeating an incumbent to win my seat in the legislature. I was 24 at the time. I then went on to serve as the head of the campaign committee and helped enough other candidates to win to propel my party into the majority. I know campaigns and I know that yard signs can play a key role in any victory. Please read on to learn more about how to use yard signs in a way that can make a difference for you. Yard signs can be an important part of local and legislative elections because they can 1) very quickly raise name identification, 2) create a sense of momentum, 3) protect a candidate against being labeled a “radical,” and 4) help create an organizational structure. Because of these important benefits, candidates should be sure they do yard signs well. When I was preparing for my first State House election, I visited with many people who had previously run – some successfully and others not. One particular candidate told me that when it came to yard signs, I needed to put up about 50 signs across my district. She went on to say that most candidates put up about that many. There were two things that jumped out at me immediately: first, this candidate had lost, therefore, I was skeptical when she said that was all I needed; and second, if most candidates put up 50 signs, then I knew I would definitely be putting up more than that because I intended for my campaign to be much more than what “most people” did. A good rule of thumb is to try and raise about one sign for every 30 registered voters. In some districts that may be too high or too low, but it’s a good place to start as you determine your yard sign strategy. But just determining your target goal for yard signs isn’t enough, you also have to determine your ratio of large signs to small signs. Large signs are typically 2’x4’, 4’x4’ or 4’x8’. Small signs should generally be no smaller than 14″ x 28″ if you want them to be noticed. Rural districts will need a much larger proportion of large signs to small signs – perhaps a 50/50 ratio; while urban districts will need fewer large signs, but should probably try to have at least 25% of the larger for the busier thoroughfares. Small signs should be reserved for neighborhoods. A standard rule of thumb would be to place large signs on streets where the speed is 30 MPH or faster and small signs in neighborhoods with speeds of 30 MPH or slower. To make a big impact on voters and donors in a small amount of time, a campaign should overwhelm the district with yard signs all at once. Some campaigns dribble their signs up slowly over a period of weeks. This may be sufficient, but it lacks the real punch that yard signs can bring to a campaign. To make a real impression, a candidate should be first and biggest with yard signs. That means choosing a weekend and raising the yard signs all at once. This will have a more dramatic impact and create a sense of momentum for your campaign (not to mention scaring the daylights out of your opponent). Candidates should use yard signs as an opportunity to show voters that their campaign has viability. While incumbents frequently have advantages in money and name identification, there is no reason that a challenger can’t have the most yard signs – it’s simply a matter of determination and aggressive yard sign recruiting. The most effective way is to combine your dooknocking with your yard sign recruitment. Target the busiest streets for door to door work first, and for those people who are friendly, ask them if it would be okay to put a sign in the yard. Distribute volunteer/yard sign cards at every opportunity and actively encourage people to fill them out and give them to you or a volunteer before they leave. Organize phoners to call voters who live in your district (or on a busy road near your district) encouraging them to take a yard sign for your campaign. This will be most effective with members of your own party or with friends and acquaintances. Include a volunteer/yard sign card in mailings that you send out to constituents and voters. Have a prominent yard sign form on your web site. Candidates always struggle with the type of sign to purchase. There are three materials predominantly used for political signs: plastic bags, corrugated plastic, and weather proofed cardboard. Here are some points to remember about them as you pick and choose. Corrugated plastic Hold up well through bad weatherEasy for volunteers to handleRecyclable. A little more expensive than posterboard. Yard signs can also be an effective defense against negative attacks. Frequently through broadcast media or even whisper campaigns, an opponent will try to paint a candidate as “radical,” “risky,” or even “dangerous.” But if a district is blanketed with hundreds or thousands of yard signs, each displaying their own personal endorsement, voters will be a lot less likely to believe that the candidate in question could be much out of the mainstream. Yard signs bring viability and votes to a campaign, all the while forcing it to rise up and accomplish its organizational goals as well. For those candidates wanting to even the playing field with an opponent who has an advantage, making yard signs a central focus in your next local or legislative campaign can play a part toward that goal. To get started with putting together a winning yard signs strategy, contact us by clicking here. When these candidates and causes needed a partner for success, they knew to turn! Catch Steve Grubbs on 4 the Record!